Sunday 13th. 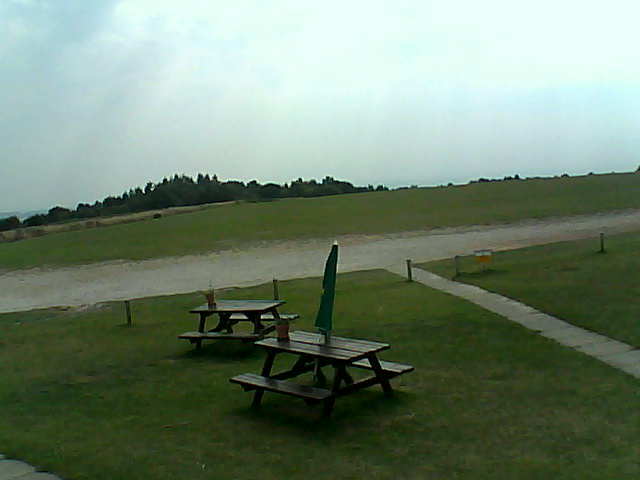 A light to moderate WNW'ly flow greeted members arriving on site and flying got under way off runway 24 around 1030 hrs. 2 ATs were flown in K21 JVZ before flying came to a halt as the wind increased in strength to become moderate to fresh and veered into the NW, the gustiness also increasing. John Carter and Steve Thompson had the first flight, their take off, flight of 29 minutes and landing being under benign conditions. Steve then flew with George Claydon for 33 minutes, their take off, flight and landing being definately not under benign conditons, so that was the end of flying for the day. Monday 14th. The wind had become a light WNW'ly and slowly backed into the WSW as the day progressed, and with patches of medium level cloud at times, the day was set for some unfettered flying. The only fly in the ointment was a lack of members, so flying was restricted to 3 ATs off runway 24 in K21 JVZ, John Carter and Max Rutter flying 2 of them and Duncan Pask flying JVZ solo on the other. Flight times were in the range 20-28 minutes off tows to 2,500/3,000' QFE. Tuesday 15th. A moderate to fresh WSW'ly blew all day providing turbulent hill lift and wave, as well as some sporting final approaches to runway 24. 12 winch launches were flown, with all the subsequent flights exceeding 30 minutes and 6 exceeding an hour. John Carter and Graham Evison took the first launch to assess the conditions, climbing to 5,200' asl in their flight of 38 minutes, and radioing the go ahead for additional gliders to be flown. Members took this to heart with all the available 2 seaters and 3 of the available single seaters flown. Bill Payton had the longest flight of the day, 3:10, taking the DG303 to 9,700' asl and visiting Masham, Leyburn and Barnard Castle, before setting off for Durham City. This proved to be a City too far, Bill turning back at Spennymoor and after losing a lot of height returned to Sutton after taking advantage of the friendly ATC at Durham Tees Valley airport. 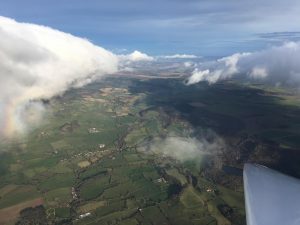 Jim McLean and Polly Whitehead took the DG1000 for a flight of 1:29 in which they climbed to 8,500' asl and limited their cross country exploits to Topcliffe, while Mike Greenacre, flying Astir DPO, had 1:19 and a climb to 4,800' asl. Pilots taking off after lunch found the wave difficult to contact as the general cloudiness increased significantly and none registered any significant climbs, having to make do with turbulent hill lift instead of smooth wave. The other flights to register an hour or more were Dave Campbell/Geoff Wright in K21 JVZ, 1:22, Brian Wise and Paul Frost, also in JVZ, 1:08, and George Rowden in Astir HVK, 1:27. John Carter has provided this photo of the well marked morning wave which he took of the first flight of the day.